Harley-Davidson® Men's Tunnel Sunglasses features a sculpted blank Bar & Shield logo medallion on both temples. 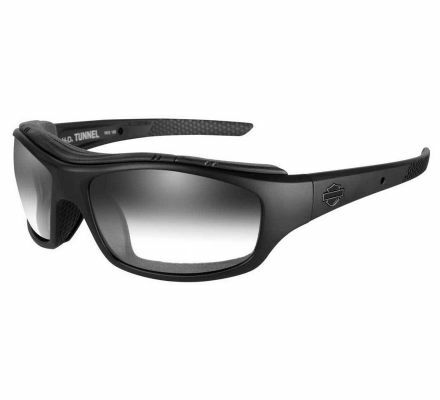 Eyewear meets ANSI Z87 high velocity impact and high mass impact requirements. This means they are able to withstand 20 .25 caliber steel projectiles fired at 150 FPS and a 1.1 lb. projectile dropped from 50". No other eyewear offers riders this level of certified protection. Click A.I.R gasket included. Click A.I.R Gaskets are the next level gasket technology. Designed to protect your eyes from harmful irritants like sand and dust, Click A.I.R Gaskets seal out the elements, creating an effective barrier to even the finest dust and dirt. Enables you to open the A.I.R Gaskets (Air Intake Regulation) With the click of a button, allowing air to flow through the gasket, effectively venting your glasses and elimination fog. Hard coating, scratch resistant coating eliminates distracting reflections of the lens surface. Anti-fog coating prevents misting on the lens in high humidity and temperature differences. PPZ™ lenses provide the benefits of traditional polarized lenses without the vision distorting pitfalls. Can be fitted with prescription safety lenses. Includes removable Facial Cavity™ Seals. Anti-Reflective coating eliminates distracting reflections of the lens surfaces. Hydrophobic (water repellent) coating, Lets the water slide off instead of sticking to the lens. Light Adjusting Gray Lenses: Darken as the brightness of the sun, the UV radiation dictates. Maximize optical clarity from dusk and into the night.